are not accustomed to subzero temperatures. As a result, my husband is going on his fourth sleepless night of monitoring farm weather station temperatures and worrying about bud damage on two of our significant crops. Only time will tell how back-to-back cold nights impacted this year’s crop. We will be cutting some peach branches and forcing their blooms to evaluate bud loss. Unfortunately, we won’t know how the blackberries faired until spring. More soon….. think warm thoughts until then! This cold weather has me in a kitchen frenzy. Over the past 2 days we have made soup, goulash, shephard’s pie, angel food cake and multiple salads. While fretting about the temperatures leaves me feeling helpless, cooking seems to lessen my pain. This is an Eckert family favorite recipe I learned from my mother-in-law. She makes it without a recipe so I had to take notes when she walked me through the steps. 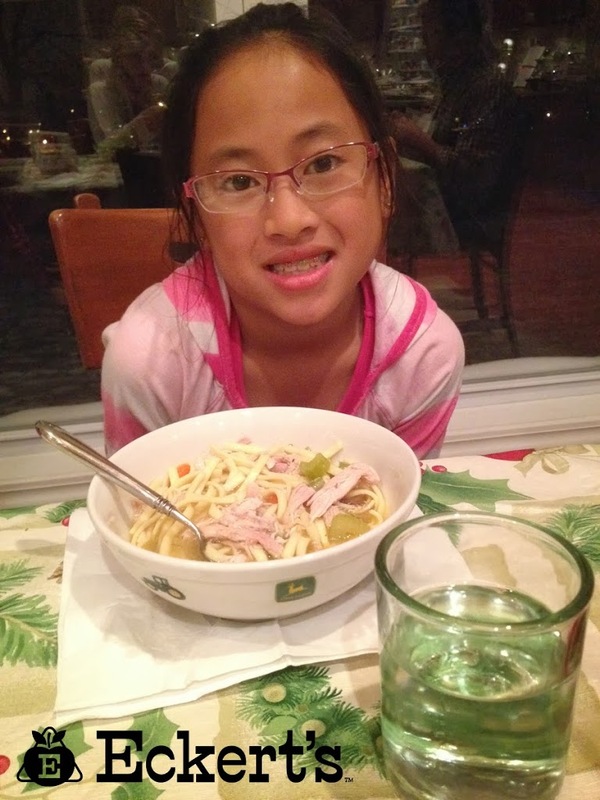 My kids adore this soup and there are rarely leftovers. I like this soup thick but you can always add more water or broth to thin it down. Season the chicken pieces with salt and pepper. In a large stockpot over medium-high heat, heat the oil. In two batches add the chicken pieces to the hot oil and cook until well browned, 4 to 5 minutes per side. Return all chicken to the pot and add all of the onions, half of the carrots, half of the celery, water, chicken base and bay leaf. Bring to a boil then reduce the heat to medium-low. Cover and simmer gently until the meat is nearly falling off the bones, about 1 hour. Skim off the foam and discard. Transfer the chicken to a plate and let cool about 10 minutes. Strain broth through a fine mesh strainer or a colander lined with cheese cloth. Measure remaining broth. Discard bay leaf and vegetables. Remove skin and bones from chicken. Tear chicken into pieces. broth to measure 5 cups of liquid and return to stockpot. Add chicken pieces, remaining carrots and celery to stockpot and bring to a boil. Reduce heat to low; cover and simmer about 10 minutes or until carrots are nearly tender. Add noodles and simmer another 10 minutes. Salt to taste and serve. *If you don’t have access to the Bouillon Chicken Base, substitute 2 cups of chicken broth and reduce water to 3 cups. 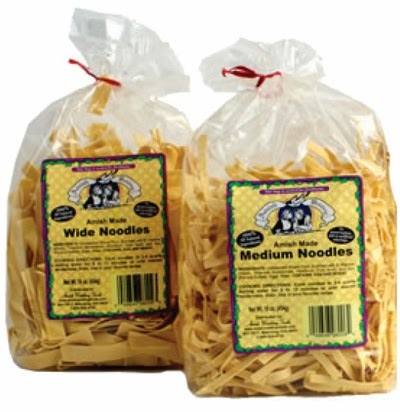 At our Country Store this month, our Amish Noodles are on SALE. Pick up any two bags for only $6, regularly $3.99 each. This deal expires 1/31/14. Check out our other specials by viewing our insert sheet here: http://www.eckerts.com/insert.htm.